Update (10/24 6:50pm): It appears this deal is limited to those in the US, but several of our readers are reporting that by disabling location services the free download will appear. 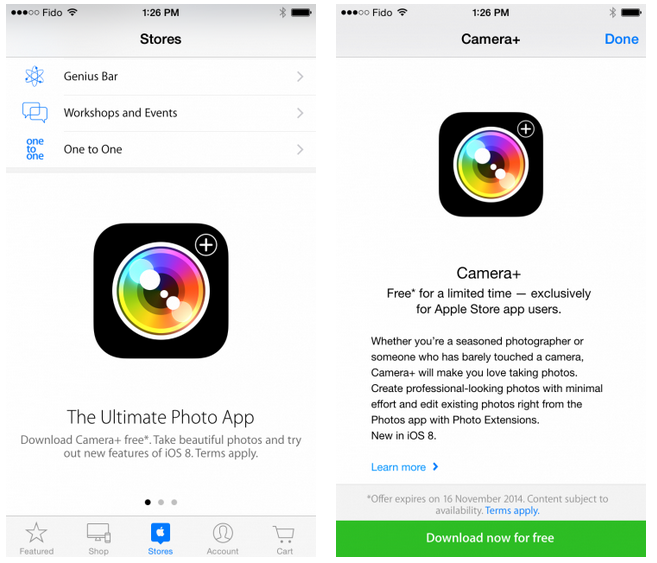 Popular iOS photo app Camera+ is available as a free download today inside of the free Apple Store App. Note: Once you have installed the Apple Store app on your device, simply choose the Store tab along the bottom, and scroll down to the freebie offer. Regularly listed at $2.99, this marks the very first time we have seen Camera+ available as a free download. The popular photo taking and manipulation app sits with 4 stars from 30123 Ratings. It’s all about one thing… great photos! With over 10 million copies sold, Camera+ clearly has some desirable features and useful tools for “seasoned photographers or someone who’s barely touched a camera.” Full feature list below. Head over to our daily game round-ups for all the best deals across all platforms and be sure to check out Apple’s free App of the Week. Touch Exposure & Focus Set exposure separately from focus. You can now easily control how light or dark your shots come out. Shooting Modes Use the Stabilizer to steady your iPhone and get the sharpest photos you can. There are countless uses for the Timer including taking the highest-quailty self-portraits. Capture all the action by using Burst to take rapid streams of shots. Digital Zoom Up to 6× zoom with advanced digital processing provides you with quality that simply blows away the competition. Front Flash How many times have you wanted to take a pic of yourself in a dark room but couldn’t. Well, now you can! Horizon Level Use the Horizon Level to eliminate taking crooked shots. Clarity Clarity is one of the biggest breakthroughs to happen to image processing in a long time. Clarity analyzes your photos and makes several intelligent adjustments that magically bring out details and breathe life into dull photos. With Clarity, you’ll stop throwing out bad photos… you’ll be amazed to see what it can do to photos that you’d typically consider unusable, like shots that came out too dark. Scene Modes Most modern digital cameras all have scene modes to help you get the best photos for your particular situation. With Camera+, you get to choose from several scene modes including Food, Sunset, Night, Portrait, Beach, and many more. Effects Professional photographer, Lisa Bettany created a slew of stunningly beautiful effects. Make your photos shimmer with “HDR”… get down and dirty with “Grunge”… fill your pics with emotion and despair with “So Emo”. And this is just the tip of the iceberg… there are dozens of 1-touch effects for you to experiment with. Lightbox All the pics you take in Camera+ go in the innovative Lightbox where you can quickly and easily skim through them and get rid of bad shots. You save only the photos you’re satisfied with so that your camera roll stays neat and clean. Sharing Whether you want to show your results to your friends and family or the whole world, Camera+ has got you covered. Proudly share your photos on Facebook, Twitter, and Flickr. Or go the more personal route and email or message them from right within the app. iCloud Lightbox sync Automatically sync your Camera+ photos between all of your devices. Shoot all day on your iPhone… and then edit at night on your iPad. Crops If you didn’t line-up your shot perfectly when you took it, you can easily fix that with Camera+. And when you want to get a bit creative, we setup a bunch of popular crop sizes for you. With a single tap, you can make your pics square, 4×6, 8×10, and more. Borders With Camera+ you get several great border designs, from simple black and white borders to more gritty designs, you’ll be able to add wonderful finishing touches. Captions Have some fun with your photos by putting captions on them. It’s a great way to really personalize your favorite shots.